America's debt is its biggest national security challenge, according to top Pentagon brass. Here's why. Money is on everyone’s mind these days in Washington. Congress is embarking on a high-octane debate over the government’s profligate habits. It promises to be a legislative brawl that could make the ObamaCare negotiations seem civilized. The stakes are high, as President Barack Obama noted in his recent speech. This week, Standard and Poor’s threatened to downgrade the government’s credit rating if the U.S. doesn’t get its budget in order. If that happened, the U.S. would quickly face even higher interest payments on our debt, and American power would be severely eroded. Meanwhile, a deeply divided Congress must agree to raise the country’s debt ceiling by May 16. Not doing so would cause us to default on our loans, shattering one of America's chief economic assets: reliability. Washington’s fiscal health is by no means a matter for the bean counters. America’s chief military officer, Adm. Mike Mullen, has famously said that the single biggest threat to U.S. national security is not Al Qaeda, China, Iran or North Korea. It’s the national debt. Is the U.S. really as broke as everyone says it is? Is Mullen right that this is a security threat? Well, yes. Without a doubt. This year, the government will take in about $2.2 trillion and spend $3.8 trillion. For every dollar it collects, it spends $1.70. Things are looking up somewhat, at least in theory. In 2012, according to the budget Obama submitted to Congress, the U.S. will spend about $80 billion less ($3.7 trillion). And as the economy recovers, the Treasury will take in $425 billion more ($2.6 trillion). At least, that’s what the administration expects. Obama’s budget risks getting larded with pork as it works its way through Congress. If Obama’s budget were to be signed into law, the U.S. would spend $1.42 for every dollar it collects. That’s better than 2011, but no one would call it good. You hardly need to crunch numbers to conclude that this is unsustainable. The U.S. currently owes more than $14 trillion dollars. In 2011 we will pay $205 billion in interest — about $1,600 per household. According to Obama’s budget, by 2020, interest payments will jump by more than 400 percent, to $863 billion. So here’s the national security question: Will the Chinese — who disagree or compete with the U.S. over ideology, territorial issues, resources and a multitude of other issues — lend us that money? And what will they demand in return? How much money comes from taxpayers versus corporations? So individuals pay six times more tax than corporations. While it’s tempting to raise more from corporations, some experts argue that this is the wrong approach, especially given the need to create more jobs. “The corporate income tax is more harmful to long-run economic growth than other taxes, which is why governments around the world, including left-wing governments, are reducing [them],” said Alan Viard, a scholar at the Republican-leaning American Enterprise Institute. Can’t we just fix the deficit by slashing wasteful spending and cutting back on all those government departments in Washington? Unfortunately, that won’t solve the problem, not even if we shut down every non-security, federal program. Entirely eliminating these outlays — including money for highways, education, justice, science, cancer research, diplomacy, the environment and other government programs — would cut many jobs, harm the economy and dramatically impact our quality of life. And it would only reduce spending by about 12 percent. Put another way, instead of spending $1.42 per dollar it collects, the U.S. would be spending about $1.25, and we’d soon have the infrastructure and institutions resembling Somalia's. If government bureaucrats aren’t wasting it, where does all of our tax money go? Mainly two places: social entitlements and national security. Entitlement programs burn nearly 60 percent of the total budget — $2.1 trillion out of $3.7 trillion. Most of that goes to retired people. 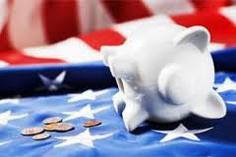 The government pension program (Social Security) costs $761 billion, and health care for the elderly costs $468 billion. A smaller allotment ($269 billion) supports health care for the poor, known as Medicaid. And a final $598 billion funds "other mandatory programs" established by Congress, including unemployment, Food Stamps, and retirement benefits for soldiers and federal civil servants. These entitlements pose a challenge for lawmakers: cutting them would harm the most vulnerable, and would impact many voters, making this both practically and politically unpalatable. The rest of the spending goes to national security. By sheer force of firepower, America is the strongest nation in history, able to wipe out entire countries at the press of a button. But that force comes at a steep cost. America’s sprawling national security apparatus is poised to cost $881 billion in 2012, up from $815 billion in 2010. To put this in perspective, if the U.S. security budget were a country, it would be the world’s 19th biggest economy, behind Australia (population 22 million) but ahead of Iran (73 million), the world’s fourth biggest oil producer. Only two states, New York and California, have economies bigger than the security budget. Incidentally, the Corporation for Public Broadcasting’s hotly debated federal subsidy ($445 million) is equal to about four hours of security spending (disclosure: GlobalPost syndicates journalism to the PBS NewsHour, which is supported by the Corporation for Public Broadcasting). How does the U.S. manage to spend so much on security? The Defense Department budget accounts for the biggest portion of this: $553 billion. That’s roughly equivalent to what America’s biggest company (Wal-Mart) and biggest bank (Bank of America) collected in gross revenues in 2010. If it were a country, the Pentagon budget would be the world’s 26th biggest economy, ahead of South Africa. In fact, that $553 billion is only part of what the Pentagon spends. America’s two major wars, in Iraq and Afghanistan, are funded by a line item called the “Overseas Contingency Operations,” which adds $118 billion to Pentagon coffers for 2012. Ironically, that’s roughly the size of Iraq’s entire economy ($118 billion in 2010). It dwarfs Afghanistan’s ($30 billion). The good news for taxpayers is that spending on Iraq and Afghanistan is down from a peak of $195 billion in 2008. Of course, battlefield realities and politics will determine whether Congress will add even more money before the year ends. Including the wars, the Pentagon spends $671 billion. That’s more twice the 2001 figure of about $300 billion. So if the Defense Department spends $671 billion, where does the other $210 billion in security spending go? Other major security programs are still pricey, but they are somewhat more opaque. According to Chris Hellman, military policy fellow at the Center for Arms Control and Non-Proliferation, the budget includes the Department of Homeland Security ($53.5 billion), the Energy Department’s nuclear weapons program ($19.3 billion), the State Department’s contribution to the war on terror ($8.7 billion), and $129.3 billion for veterans programs (including disability, education and medical fees). Additionally, the intelligence budget is classified, but the 2010 allocation is known to be at least $80 billion, according to Hellman. How does the Pentagon manage to spend so much money? The short answer is that it’s a big military. Pentagon operations sprawl across the planet. Excluding Iraq and Afghanistan, the U.S. operates about 760 bases in 39 countries, according to research by Mother Jones. Collectively, these occupy a land area slightly bigger than North Korea. The military employs about 1.5 million soldiers, with a similar number on reserve. The largest portion of the Pentagon’s budget goes to operations and maintenance ($172 billion), “to support training and readiness.” Weapons systems ($113 billion) come next, with the radar-evading Joint Strike Fighter ($9.7 billion) taking the largest chunk. The Pentagon’s research and development program ($76.7 billion) consumes the third largest sum, spending roughly the amount the government provided in food stamps for about 40 million people at the height of the financial crisis. The Pentagon budget also includes a fortune for social programs benefiting soldiers. The Military Health System ($52.5 billion) constructs hospitals and clinics, and sets aside money for retired soldiers’ Medicare. An additional $8.3 billion “supports military families,” including $4.7 billion “to improve service members quality of life,” $2.4 billion for schools and education, and $1.2 billion for child care. So the U.S. spends 40 to 70 percent more than we earn in revenues. What can be done about this? That’s the multi-trillion dollar question, and the one that politicians will be debating in the coming weeks, months and perhaps years. Clearly, as Obama has suggested, no part of the budget can be considered sacrosanct. Slashing the Pentagon’s spending back to 2001 levels and eliminating all non-entitlement government spending (highways, justice, education and the like) would not close the deficit — especially as baby boomers retire, pushing the annual entitlement bill up by 50 percent in the coming decade. In a nutshell, the U.S. confronts few appealing options: we can plunge the elderly into poverty; dramatically scale back our security and quality of life; or increase taxes. A compromise would spread the pain among all of these options. Or we can do none of the above, and consider learning to speak Mandarin.